Being able to intern in the US straight after graduating was a dream come true, says AUT creative technologies alumnus Matthias Bachmann who worked at the DaVinci Institute in Colorado after completing his AUT degree. “I had always wanted to work in the US, especially given it’s the tech hub of the world. At the DaVinci Institute, I was involved in a lot of things, including UX reviews, social media management, video production and livestreaming, general design work, lots of networking and participating in brainstorming sessions. “I really enjoyed working on all the events we hosted. 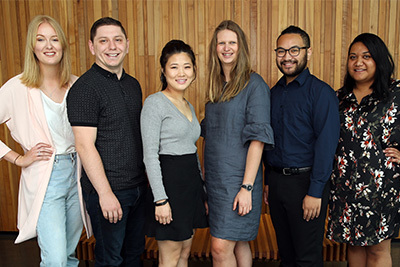 I got to hear from industry leaders, and network with some pretty incredible people that work in the Colorado business and tech scene,” says Matthias who got the sought-after internship through the AUT Internz International Scholarships Programme. It’s opportunities like this that make him a proud advocate for AUT, Matthias says. “I’ll forever be an advocate for AUT. 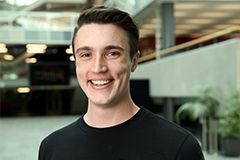 I loved all the opportunities I was given – from the CO.STARTERS@AUT entrepreneurship programme and AUTEL Innovation Challenge, to the AUT Internz and the Summer of Tech internship programmes. His advice for other students is to make the most of all the opportunities on offer. Having always been passionate about technology, Matthias was attracted by the freedom AUT’s Bachelor of Creative Technologies offers. “I always knew that I wanted to work in the tech industry, but I wasn't quite sure what area I wanted to specialise in. After being able to try his hand at different disciplines, Matthias decided to specialise in UX/UI design; skills that are essential for his current role as a UX/UI architect and strategist at blockchain company Centrality. He joined Centrality after returning to New Zealand at the end of 2017.